Notes: Nationally scarce (Nb) in woodland and along freshwater margins throughout the British Isles, except in northern Scotland. In Hampshire virtually unknown away from Botley Wood, with just a handful of records elsewhere in the county and on the Isle of Wight. Wingspan 17-21 mm. Black and white forms may be confused with A. lineana, but A. semifasciana has broader forewing and lacks the greyish suffusion along the dorsum; another possible confusion species is A. infida but generally darker, with a less outwardly oblique inner edge of the median fascia, and more weakly angulate outer edge of the subbasal fascia [Bradley]. 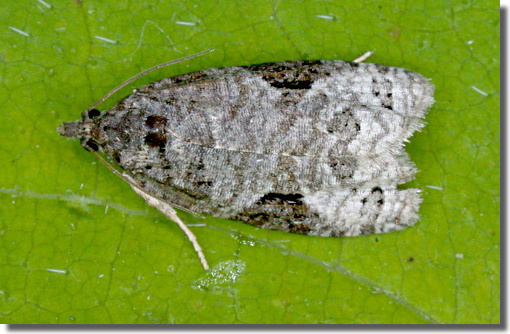 Larva feeds on catkins of Sallow, subsequently living within a leaf-fold.